European Space Agency astronaut Sam Cristoforetti captured this shot of Russia's Progress 58 cargo vessel approaching the International Space Station on Feb. 17, 2015. A robotic Russian cargo ship arrived at the International Space Station today (Feb. 17), capping off a busy week of comings and goings at the orbiting lab. Russia's unmanned Progress 58 spacecraft docked to the Zvezda service module at 11:57 a.m. EST (1657 GMT), delivering 3 tons of food, fuel, experimental hardware and other gear to the six crewmembers aboard the station. Progress 58 had launched just six hours earlier, blasting off atop a Soyuz rocket from Baikonur Cosmodrome in the Central Asian nation of Kazakhstan at 6 a.m. EST (1100 GMT; 5 p.m. local Kazakhstan time). 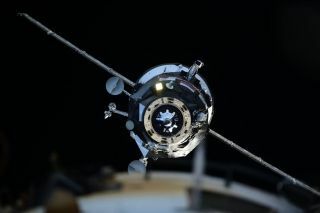 The Russian cargo ship's arrival comes just three days after Europe's last robotic freighter, the Automated Transfer Vehicle-5 (ATV-5) — named Georges Lemaitre after the 20th-century Belgian priest and astronomer — said farewell to the station. Russia's Progress 58 cargo spaceship launches atop a Soyuz rocket from Baikonur Cosmodrome in Kazakhstan on Feb. 17, 2015. Georges Lemaitre left the orbiting lab on Saturday (Feb. 14), freeing up the Zvezda parking spot for Progress 58. Georges Lemaitre then burned up in Earth's atmosphere as planned on Sunday (Feb. 15), bringing an end to the European Space Agency's ATV program, which had flown five resupply missions to the station since 2008. California-based SpaceX holds a $1.6 billion contract with NASA to fly 12 cargo missions to the orbiting lab using Dragon and the Falcon 9 rocket. SpaceX has now flown five of these missions; all have been successful. Progress 58 will stay attached to the space station until August, NASA officials said. The cargo vessel will then be loaded up with trash and plunge to a fiery death in Earth's atmosphere.